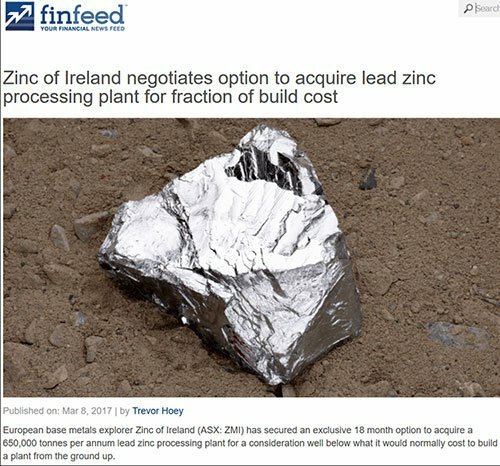 Zinc of Ireland (ASX:ZMI) is a “right metal, right location and right time” type of story, having listed on the ASX in mid-2016 and quickly acquiring highly prospective zinc lead tenements –just as the zinc price hit long-term record levels. What better time then, to be starting a 3000m diamond drilling program at its Kildare zinc project in Ireland, which it said on 2 March would start today. ZMI’s project is 80km along strike from Lisheen, Europe’s second biggest zinc mine. Along with the Lisheen resource (22.4 million tonnes grading 11.6% zinc), ZMI also sits amongst some of the world’s leading zinc players including Teck, Vedanta and Boliden. LME zinc stockpiles are at 12 year lows and the zinc price is not too far off the nine year high price of nearly US$3000 per tonne (US$1.33 per pound). But now the moment has arrived for ZMI to plunge the drill bit and hopefully unlock some new zinc discoveries – which means this may be just the beginning for this $12M capped stock. ZMI has pulled together six different licenses in Kildare into one company for the first time – facilitating a more holistic approach to exploration which will hopefully increase the chances of making further discoveries in addition to those from the end of 2016, and before that in Kildare. With bucketloads of geological and geochemical data, (previously overlooked in the 70s and 80s) ZMI’s geologists have had a lot of data to study, which has resulted in this sharply defined, imminent 3000m drill campaign. Whilst many in the commodities sector believed zinc had run its race in 2016, it has actually gone on to post another 10% gain in early 2017. 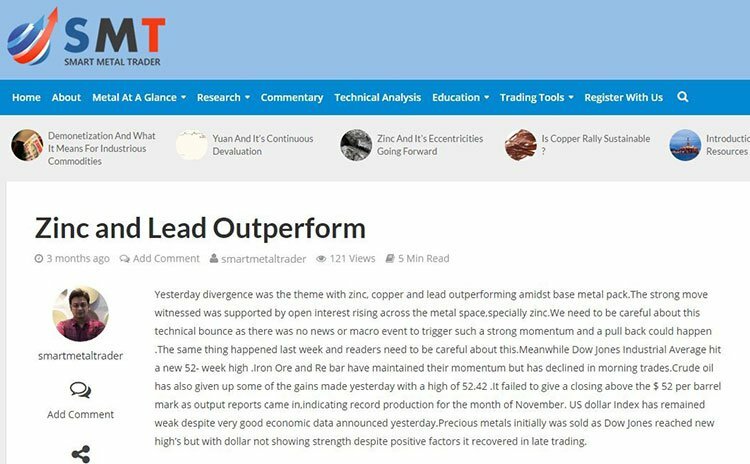 Also of significance is the fact that lead was the best performing base metal in the first two months of 2017, increasing 13%. This is particularly good news for ZMI as it embarks on second phase drilling, targeting more of the same high grade mineralisation identified towards the end of 2016. In this commodity price environment, positive drill results could potentially have a material impact on the company’s share price, especially, if as expected, zinc prices continue their run into 2018, but more on that later. The other big news for ZMI, less than a week after receiving final clearances to commence its drilling program, the company negotiated an option agreement to acquire a 650,000 tonnes per annum zinc lead processing plant which could facilitate a smooth and timely transition should early stage production be an option. Should this transaction be completed it would definitely be a coup for ZMI as the build cost for such a plant would be more than 10 times the prospective acquisition price of $8 million. However, that is getting ahead of ourselves a bit. Firstly, we need to examine exactly how this diamond drilling campaign is shaping up. Zinc of Ireland (ASX: ZMI) has once again demonstrated its experience in the all-important exploration stage, having engaged the largest provider of diamond drilling services in Ireland and the UK to undertake its upcoming program. Zinc Drilling Begins for ZMI: Results Pending . ZMI’s willingness to look at the big picture even in the early stages when it drilled below historic levels in the first phase of exploration paid dividends with narrower width intersections grading up to 35.7% zinc compared with two thicker zones (+14 metres) grading 11.1% zinc and lead and 7.3% zinc and lead. However now it is at a point where it will conduct 3000 metres of diamond drilling starting today – designed to test multiple prospects, including extensions of mineralisation at previously drilled prospects and a number of newly identified high priority exploration targets. And should the drilling progress quickly, ZMI has secured an exclusive 18 month option to acquire a 650,000 tonnes per annum lead zinc processing plant for a consideration well below what it would normally cost to build a plant from the ground up. Let’s look at the all-important drilling first. 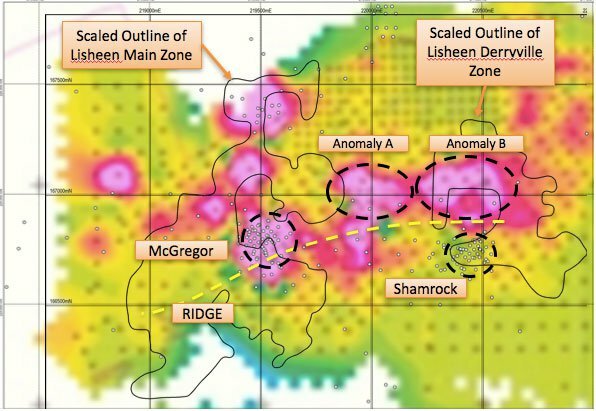 Of significance will be the McGregor prospect where thick intercepts of high grade zinc lead mineralisation were delineated late last year, and newly identified structures coincident with deep overburden anomalies and surface soil anomalies. 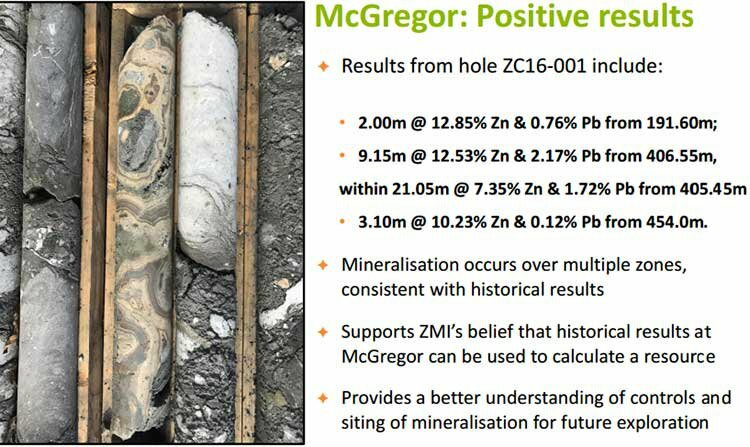 The following demonstrates the impressive drilling results obtained by ZMI from McGregor last year. There are several aspects of any exploration program which are potential share price catalysts, and particularly given the expertise within the company, all of these are in play. However as an early stage play, ZMI still has a long road ahead meaning investors should take a cautious approach to their investment decision with regard to this stock. Firstly, there is scope to prove up the size of the resource within current bounds, and in so doing establish new grades. There is also the possibility of locating new mineralisation outside known parameters through step out drilling, and within untested anomalies which have been identified as seen below. However, the real wildcard could relate to ZMI’s deep drilling success in 2016 when it identified new high grade ore at depths below current mineralisation. This could be a game changer in terms of valuing the group’s landholdings and establishing a mineral resource at an early stage. Drawing together this information, there is the prospect that ZMI will be able to establish a JORC compliant resource in the near term and identify greenfield targets that have the potential to add to that resource. The Kildare project is located 40 kilometres south-west of Dublin and the landholdings are not just considered highly prospective because of the volume of mineralisation and robust grades, but they also host Mississippi Valley type (MVT) ore which is recognised by the industry as particularly easy to treat. 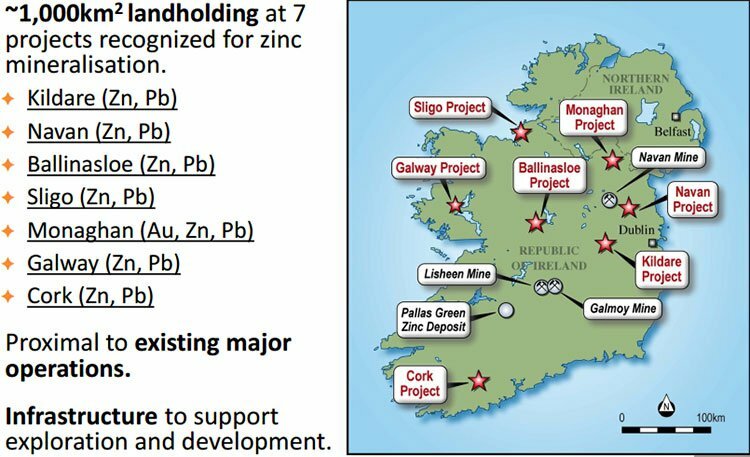 The other aspect to Kildare that has ZMI investors optimistic is the fact that the project is on the Rathdowny mineralised trend, 80 kilometres along strike from Lisheen (22.4 million tonnes grading 11.6% zinc) and among some of the world’s leading zinc players. 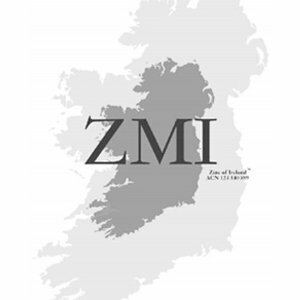 As can be seen from the map below ZMI has pegged out a substantial number of tenements across Ireland with a total landholding of more than 1000km2 across seven projects which are already recognised for zinc mineralisation. For commodities investors, zinc and lead could be the places to be in 2017 and are forecast to increase by 13% between the first quarter of 2017 and December 31, 2017. A first-quarter base figure of US$2740 per tonne predicted by Macquarie has already been eclipsed in February when the metal hit US$2970 per tonne. Hence, Macquarie’s ten-month outlook estimate of US$3100 per tonne could be conservative. It is a similar story with lead with the price estimated to increase from US$2300 per tonne in the first quarter of 2017 to US$2600 by December 31, 2017. Lead traded as high as US$2465 per tonne in November 2016, and in 2017 it hit US$2440 per tonne on February 13. It should be noted however that commodity prices do fluctuate and caution should be applied to any investment decision and not be based on spot prices or analyst predictions alone. Seek professional financial advice before choosing to invest. The other reason to be encouraged by this data is that the strong pricing environment is expected to be maintained at least until 2018 with zinc forecasts at US$3100 per tonne and lead at US$2450 per tonne. To put lead’s substantial rerating into perspective, it hasn’t traded at these levels since 2011. One has to go back even longer to identify these premium prices with regard to zinc, which last traded above US$3000 per tonne in 2007. Commodity price momentum is important in ZMI’s case given the prospect that it could enter production earlier than expected taking into account the substantial exploration progress made to date and the fact that it has already paved the way for the acquisition of a processing plant. As mentioned, the securing of an exclusive 18 month option to acquire a 650,000 tonnes per annum lead zinc processing plant for a consideration well below what it would normally cost to build a plant from the ground up is a significant development for ZMI. The plant was originally commissioned at the Galmoy project, which is located on the Rathdowny mineralised trend in Ireland, indicating that it is geared to process similar ore to that being targeted by ZMI. In fact, the Galmoy project is located only 70 kilometres from ZMI’s Kildare project. In 2011, the plant was sold and relocated from Ireland to Darwin where it remains in storage. The Heads of Agreement negotiated regarding the 12 month option to acquire the plant requires ZMI to make a payment of $100,000, with the potential for a six-month extension for a further payment of $50,000. This will provide ZMI with ample time to conduct due diligence including engineering and logistical studies. Furthermore, in the interim the company will be gaining a better understanding of the Kildare project. Upon exercise of the option the consideration to be paid is $6 million in cash and $2 million in ZMI’s shares based on the 20 day volume weighted average price at the time of the option being exercised, or $2 million in cash at the sole discretion of ZMI. The potential planned acquisition ties in perfectly with the drilling program and possible resource definition. In fact, the option to acquire the Galmoy plant complements ZMI’s drilling plans, which are aimed at delineating a resource in the near term, as well as testing completely new greenfield targets where it believe there is outstanding discovery potential. The Kildare Project is a real development opportunity that ZMI is looking forward to advancing to the next stage at a time when zinc market fundamentals are strong and there is considerable investor interest in new projects. When ZMI embarks on the necessary studies required to determine the financial viability of the Kildare project, it will have a clear picture of the upfront capital expenditure component with the most significant big ticket item already paid for. This not only assists ZMI in making its own internal decisions, but with the prospect of a fairly defined capital expenditure component known upfront it is much easier to progress project financing, removing some of the hurdles in the de-risking process. ZMI is now positioned well to transition from explorer to producer in a more timely and efficient manner. By de-risking elements of its Kildare Project, it could move share prices as it moves towards resource definition, and further down the track, hopefully maiden production.